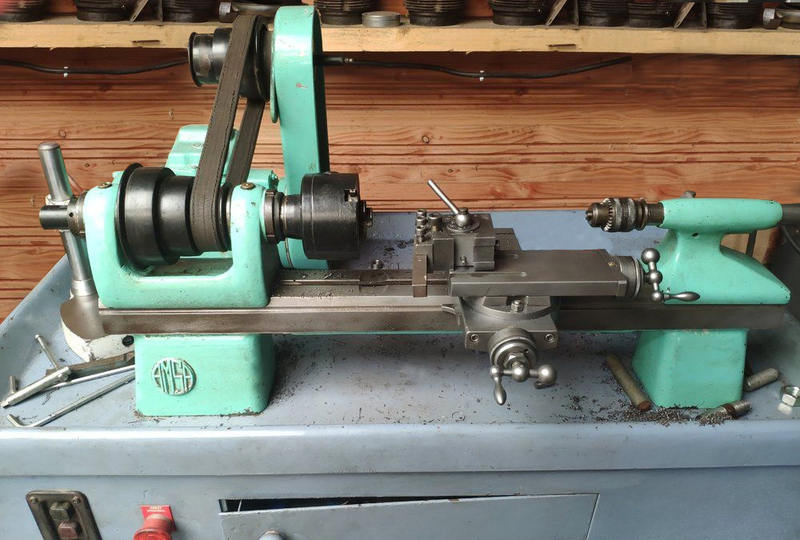 From an unknown maker - though believed to be French - the AMSA lathe was a typical "Bench Precision" type intended to be used by a toolmaker engaged in simple but highly accurate work making one-off parts. This type of lathe was, typically, fitted with a headstock having a screw-operated draw-in collet attachment, a screw-action tailstock and a screw-feed compound slide. Although not fitted with screwcutting by a bed-mounted leadscrew, some makers did offer what was usually a beautifully made screwcutting and power feed attachment where a bracket, carrying changewheels, was bolted into the left-hand end of a T-slot that ran down the front face of the bed. A universally-joined shaft took the drive to the long-travel top slide. 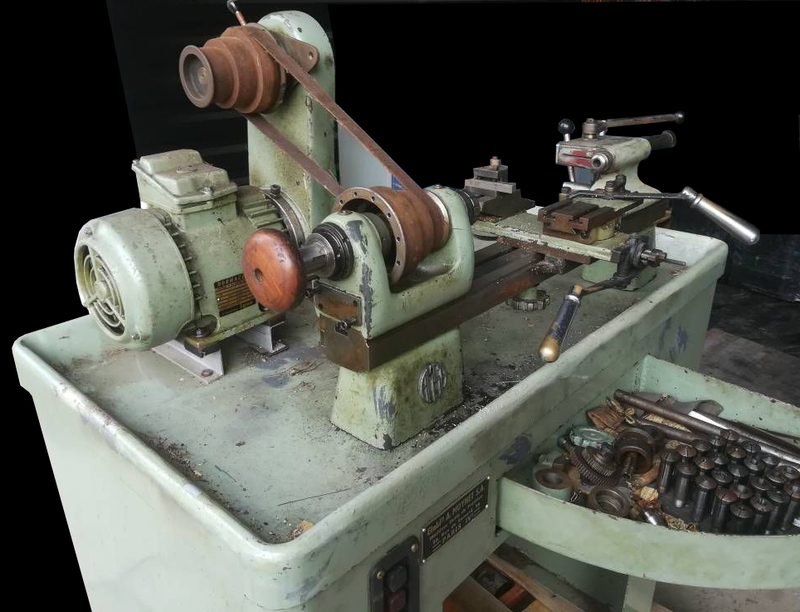 Most "bench precision lathes" were also able to perform in two others ways, one as a "Repetition" or "Second-operation" lathe when fitted so that all movements - collet closer, cross slide, top slide and tailstock - were operated by quick action levers. The final type was as a production lathe, this too having time-saving lever-operation of every travel but also fitted with a bed-mounted 6-station capstan or "turret" head. So fare two examples of the AMSA have been found, one set up as a toolmaker's lathe, the other as a second-operation machine - hence, the likelihood is that the makers would also have offered a bed-mounted capstan unit. With a centre height estimated at 100 mm and a between centres capacity of perhaps 400 mm, the AMSA used a bed typical of its type with a T-slot running the length of the flat top face and bevelled faces at each side to accurately locate the headstock slide-rest assembly and tailstock. In this sense it was very similar to the well-known Schaublin 102, a Swiss-made lathe offered with a number of different headstocks, slide rests, tailstocks together with a very wide range of accessories. The headstock appears to have held adjustable bronze bearings in which would have run a hardened and ground spindle. With bearing adjusters fitted to just their outside faces, it's likely that the front bearing would have been formed with two tapers, a long, shallow 3-degree and a short 45-degree taper (in the manner first adopted in 1865 by Stark in the USA) with, possibly, a plain parallel bearing at the other end. Like most similar lathes, the compound slide rest assembly was located against the bed by a plate at the front slightly wider than the cross slide. Good-sized zeroing micrometer dials were fitted and the necessary long travel top slide, this having the usual two T-slots. Drive came from a rear-mounted countershaft of the simple but efficient "overhung" type with a central post carrying the bearings and a pulley on each side - one driven by the motor the other driving to the headstock by means of a flat belt around 32 mm wide (on the lathe shown, the motor-drive is missing). This economic design of countershaft has been widely employed on lathes as diverse as the American Allen Electric and Swiss Agathon lathe - while the Simonet used a very compact unit that incorporated not only the electric motor but a 2-speed gearbox and take-off for an "overhead". The AMSA join a short list of French made, plain-turning precision lathes that included the unusual S2F Cordima, the Crouzet, Jenny, Precis, a very early triangular-bed lathe, the Prudor, the S.O.M.B.V. and the "JCH", a make that came from Roanne, a small town to the northwest of Lyon (it's likely that they made a plain version of their unusual Type TG2). 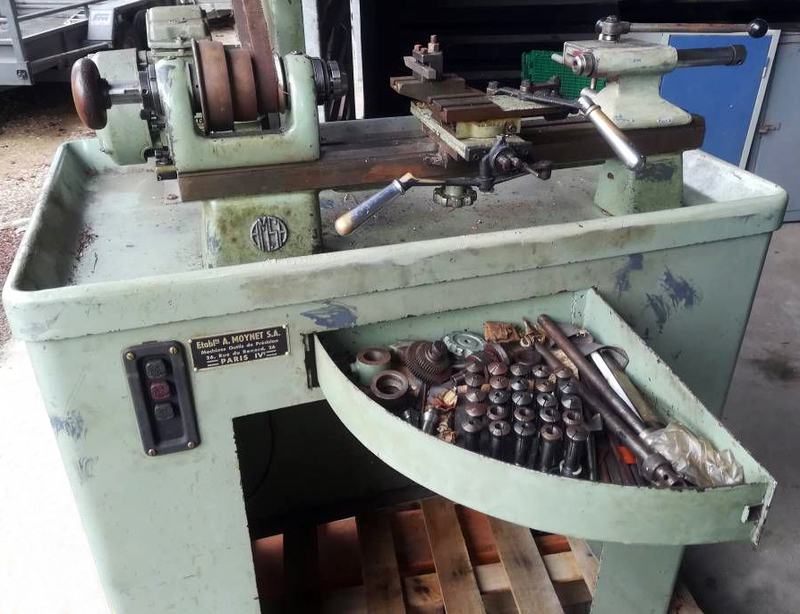 Si un lecteur a une AMSA, l'écrivain serait intéressé de vous entendre ..
An AMSA precision plain-turning lathe set up for "second-operation" work with lever action feed to the cross slide, top slide and a rack-driven tailstock spindle - but retaining a screw-feed collet draw tube on the headstock. From the cluster of gears in the storage tray, the headstock's outer face with its machined surface and four tapped holes and the hole in the front face of the top slide, it appears that a screwcutting feed to the latter (of the type shown here) might well have been fitted originally.